Crane and I slept late yesterday. We eventually decided to take a day off from blogging and went for a ride on the motorcycle. During the ride home, I thought of two additional examples of inexcusable prosecutorial bungling during the Zimmerman trial; namely, failure to adequately prepare witnesses to testify and failure to adequately protect them from harrassment by defense counsel. Dr. Shiping Bao, the Assistant Medical Examiner, apparently believed that he could write out what he wanted to say before court, read his statement to the jury, and answer any questions the jurors might have had. He put many hours of effort into preparing his report, including time spent reviewing peer reviewed papers and notes published in professional journals. That review and the autopsy results obtained by another medical examiner in a similar case led him to change two of his original conclusions. For example, he changed his opinion regarding how long Trayvon Martin might have remained conscious after the shot from an estimate of two to four minutes to possibly as long as ten minutes. Bernie de la Rionda knew or should have known that Dr. Bao probably was not familiar with court rules and procedures. He should have contacted him to find out if he had updated his official report and whether he was familiar with the question and answer method of interrogation. If he had contacted Dr. Bao, he would have realized pretty quickly that Dr. Bao had supplemented his official report and needed to be briefed on the basics. For example, Bernie would have told him that the rules limit witnesses to answering questions asked by the lawyers or by the judge. He also would have told him to stop answering a question asked by a lawyer, if opposing counsel objects, and wait for the judge to overrule the objection before answering. Rachel Jenteal also would have benefited from the same advice. Bernie owed a duty to all of his witnesses to protect them from the defense tactic of repeating a question many times and eventually changing the meaning of the question by adding or eliminating a keyword to it that the witness overlooks to the detriment of the prosecution case. 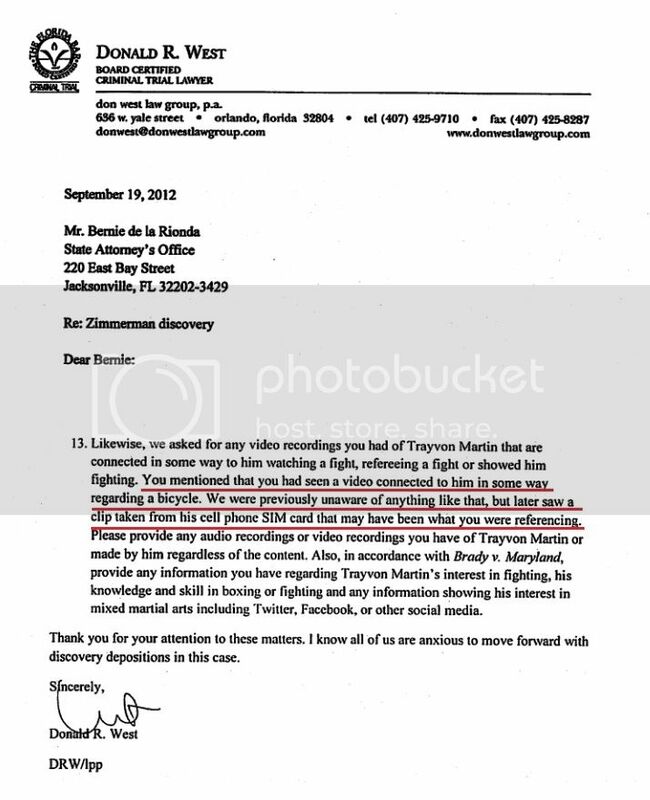 It’s a copy of a discovery-demand letter from Don West to Bernie de la Rionda that establishes that the defense knew about bicycle video clip on Trayvon Martin’s phone for at least nine months. The letter is dated September 19, 2012. You mentioned that you had seen a video connected to him [Trayvon Martin] in some way regarding a bicycle. We were previously unaware of anything like that, but later saw a clip taken from his cell phone SIM card that may have been what you were referencing. Since the defense has known about this video clip for at least 9 months, I cannot imagine how Mark O’Mara could innocently have mistaken it for a video of two of Trayvon’s friends beating up a homeless person. Mark O’Mara has some ‘splainin’ to do and the third person apology on his website ain’t gonna git ‘r done. While he is explaining his way out of that mess, he should also explain why the defense is now seeking sanctions on the ground that this video was not disclosed to them. (H/T to Big Boi for letting me know that a poster at Crime Watcher’s found the letter. He is also on Twitter as @TruthThere. Bad character evidence about the victim of a homicide is not admissible in a self-defense case unless the defendant knew it before the encounter that ended with the victim’s death. In other words, if the defendant did not know that the victim was a violent thug, he cannot introduce evidence that the victim was a violent thug in support of his claim of self-defense. Mark O’Mara is using the information obtained from Trayvon’s phone in a fruitless attempt to establish that Trayvon was a violent thug. Even if he were successful, the information would still be irrelevant and inadmissible because the defendant did not know Trayvon before he killed him. O’Mara must know this because he is a lawyer who specializes in criminal law. Since he knows this, we can reasonably conclude that he knows his motion for sanctions against BDLR will be denied. The question people should be asking is why did he file the motion since he knew it would be denied? He is using the motion as a vehicle to publicize irrelevant and inadmissible information about Trayvon Martin. He wants the public to believe that Trayvon is a violent thug who deserved to die. Since he waited to file his motion until after 500 people received a summons for jury duty, we also can tell that he is using his motion for sanctions to convince as many of those 500 people as possible that Trayvon was a violent thug who deserved to die. (2) it does prove that Mark O’Mara acted in bad faith when he filed the motion for sanctions. Therefore, Judge Nelson should sanction O’Mara for filing the motion for sanctions in bad faith. You are currently browsing the archives for the Bernie de la Rionda category.